Extremely friendly staff. Campground is well maintained, clean and quite. You are about 20 minutes from the park entrance which is very convenient if you have a tow car. Easy to access, lots of room for big rigs. We really enjoyed our stay at this facility. Our site backed up to the river, and the sound of the river at night was so relaxing. We had the best sleep in a long time. Sites a little snug. Individual restrooms were good. Park store was great. WiFi was weak. River access not available - you can see river, but can't access. This is a very nice Park well managed, clean and well maintained, we have stayed her twice while visiting Zion it is close maybe 10 minutes from the entrance to the park, Pool was great. Have stayed here twice - both times the park is clean,check in is quick and professional- and the location is great- thank you for a fabulous stay ! This is a 5 star RV park--great staff and facilities--the only complaint is spotty to marginal wifi--poor location for Verizon cell service--grainy cable broadcast--however, we will come back again. The resort was beautiful but the space was small. We were able to fit our trailer but your pretty close to your neighbors. I loved how spaces have grass. The bathrooms and showers are clean. My only complaint was I wish they had separate bathrooms instead of having it inside the showers because the lines in the morning has a long wait. We stayed in a pull through full hookup site. The facilities are very well maintained. The bathroom/shower and laundry facilities are immaculate. Staff was friendly and helpful. We'll definitely return. The resort is a short drive to Zion National Park. 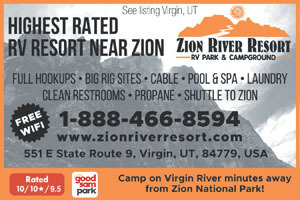 Zion River RV Resort is a 5-star RV Park and I agree with the Good Sam rating. 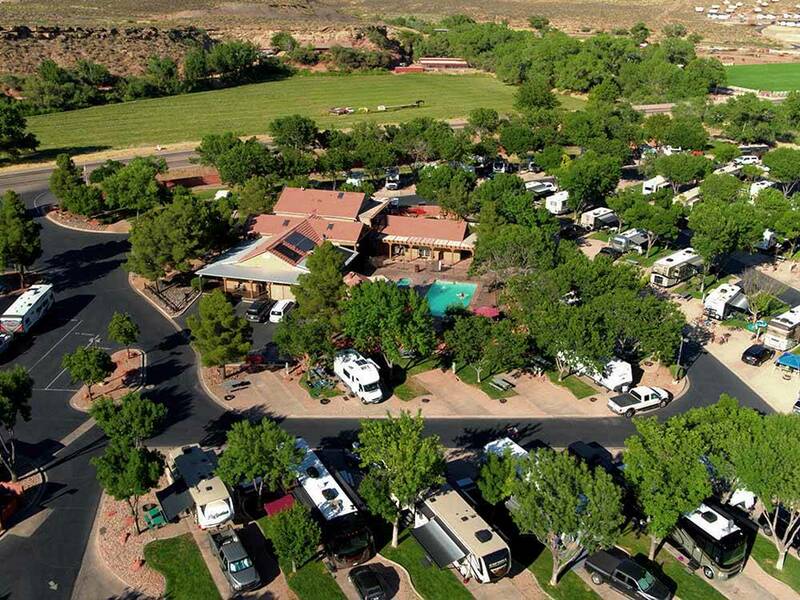 The RV Resort has very good paved roads, 50 amp power, and superb WiFi signal throughout the park. Facilities and amenities are top notch. The RV Resort is located 14 miles from Zion National Park and we preferred to stay in Virgin rather than one of the RV parks in Springdale right outside the national park in order to avoid all the hectic traffic, crowds etc. Zion River RV Resort is very quiet, which we looked forward to after fighting the crowds and traffic in the national park all day long. The staff was very friendly and helpful. The facilities were very nice. Comparing this place to a 10/10/10 resort I stayed in recently, I think this place was overall better. I had a back in spot and it worked rather well. The connections for the back-ins are located about mid-way deep in the site. While this did not cause a problem for me, I can see how a trailer who's connections are all the way in the back could have an issue. The playground for the kids is nice, but the wood is starting to show it's age and is a little weathered. The grounds are well maintained and I did see the grounds crew sweeping and raking the gravel after someone departed to make the site ready for the next customer. My family really enjoyed this campground and will be returning in the future. Nice level sites! We had been traveling for a week and our motorhome was very dirty. We were able to have the motorhome washed on site and they did a great job. No more bugs on the windshield. We enjoyed friendly neighbors and all the beautiful sights of the area. Note to big rigs - the tunnels from the East are very challenging - height, width and length restrictions. Whew! I suppose you would call this a “high end” RV park and as such the price reflects that. Nice asphalt driveways and level concrete pads with a grass strip in between, picnic table and fire ring. Pool, clubhouse, game room, laundry, etc. complete the picture. Two minor complaints, again, relative to the price. I’m not a big fan of individual toilet/shower combinations. It seems that with this configuration, people tend to leave water throughout the room so every time I went in to just use the toilet, the floor and area around the sink were very wet. Secondly, I was told that sprinklers would run during the night but was assured that it would not spray my motorhome. Turns out I ended up with hard water spots on one side of my motorhome from the sprinklers. WiFi was good but cable was a little weak, limited channel selection and some were poor quality picture. We stayed here while visiting Zion National Park. This was a very clean and well maintained RV park. The only real issue I had was that the hookups were a good distance from the rear of my trailer and luckily I had already bought electrical and sewer extensions in anticipation of going somewhere with this issue. The staff were friendly and checking in was quick. They had complimentary wine tasting the night we arrived, and although we didn't partake, it was a nice thing to have it there if we wanted. The sites were level. We had a back in site adjacent to the Virgin River and those are all gravel with an aluminum picnic table. Next time I will reserve a pull through just to have a slab and some grass. Our site was a little too close to a tree so I was unable to open my awning, but the tree did provide shade. All in all a great place to call a home base. We will come back again! Good Sam rating is accurate. Very professional employees, great facility. Exactly as an upscale RV park should be. Pet friendly. All facilities (laundry, pool, pet area, store) were spotless and in excellent condition. Our motorhome and trailer are 65'; pull through was just right. We like a lot of privacy and even with our site right next to check in; never felt exposed. Just 10 minutes from Zion and some incredible meals at Spotted Dog & Oscars in Springdale. We had one of the premium pull thru sites with a very nice level concrete pad. The laundry room was nice, but a little high priced at $2/load. Great location not far outside of Zion National Park and they had a shuttle to the park as well for a small fee. If you have Verizon cell phones, this park is a dead space. They do have a Verizon extender but you have to sit in the game room to make your calls. Overall a beautiful park in a beautiful, quiet area.